First Lady of Santoor, Dr. Varsha Agrawal is the one and only female Classical Solo Santoor player from India who has received international recognition for her brilliant performance on Santoor. 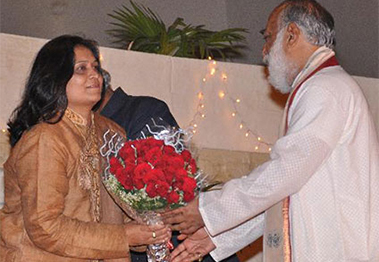 Dr. Varsha is awarded by President of India and Ministry of WCD as a First Lady of Santoor. Dr. Varsha is an emerging Classical Solo Santoor Player of Sufiyana Gharana of Kashmir & Sopori Baz. She is one of the most brilliant established artists of Santoor. She has been continuously performing on Santoor in various cities of the country & abroad. She has polished her art by strenuous training and ‘Riyaz’ and has won appreciation from audience all over the country & abroad. Dr. Varsha Agrawal is the one and only female artist of Sufiyana Gharana from India who has received international recognition for her brilliant performance on Santoor. She is the regular "A" grade artiest of santoor by AIR (All India Radio) and Doordarshan. She is the first female Santoor Maestro of india whose interview "Shakshiyat" was broadcast on Rajya Sabha TV. Dr. Varsha Agrawal is the first female Santoor Maestro of the country who travelled abroad for Santoor concerts by the ministry of external affairs, India. She is the first female Santoor Maestro In the history of All India Radio & Doordarshan whose Classical Solo Santoor recital was broadcast on the National Programme of Music as a first lady of Santoor. She has been empanelled with indian council for cultural relations (ICCR) and ministry of culture as a Classical Solo Santoor player. Dr. Varsha has published her eBook "Truely Your's" which is available on Amazon. Consistent success of an artist is necessarily based on a healthy concoction of innovation, imagination, practice and preservance and strong determination to reach the highest level of performance in his chosen field. Lalit Mahant has all these and many more qualities that lead him to success. He was born in 1948 in Ujjain, a city which is famous not only for its religious significance but also for its rich cultural heritage. Lalit Mahant's natural inclination for music was recognised first by his father Late Pt. Narsimha Das Mahant, a renowned Tabla Artist. He started nursing and nurturing this young boy's natural talents at an early age. Later on he was sent to world famous Artist of Banaras Gharana Tabla Player Padma-Vibhusan Pandit Kishan Maharaj for advanced training. He learned 'Tantra Vadhya' vocal and Tabla (delhi Gharana) under the able guidance of Late Pandit Riz Ram Desad (Mumbai). Lalit Mahant is not only a 'Gharanedar' artist but also a successful convenor. He has organised many prestigious national music programmes. He has been continuously performing on Tabla in various cities of the country & abroad. He has the much coveted honour of performing with the nationally and internationally renowned Artists such as Late Pt. Riz Ram Desad (Santoor), Pt. Bhishm Dev Vedi (Swar Darpan), Reverend Maharaj Shree Gokulotsav Ji (Vocal), Late Pt. Kumar Gandharv (Vocal), world famous Sarangi Artist Pt. Ramnarayan, Kunwar Rajendra Singh (Swarleen), Ustad Rais Khan (Sitar), Jotin Bhattacharya (Sarod), Ms. Reeta Ganguly (Thoomari). 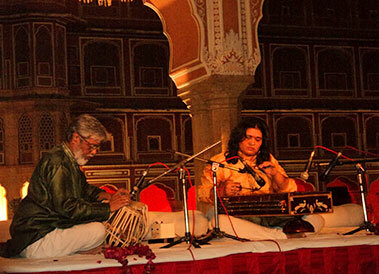 Lalit Mahant has many creditable achievements of convening successful music programmes. He has convened 'Yuva Sangeet Nritya Mahotsav', 'Sangeet Nritya Sangam', 'Durlabh Vadhya Vinod' etc. He is invited regularly as a resource person for music by many Universities examinations. Lalit Mahant is a verstaile genius. His papers, interviews and Tabla performances have been broadcast by AIR and telecast on Doordarshan. 'Param Paath', his composition on Tabla was relayed by AIR in its national programme and was broadcast simultaneously from 212 stations. He performed and received applause by the Chief-Ministers, Governors and President of India. Along with his devotion to music his literary acumen finds expression in composing many poems and articles. He is a gifted artist and well-versed in creating compositions on Tabla. His compositions are dedicated to various Indian Gods and Godessess. Notable among these compositions are 'Ganesh Paran', 'Saraswati Paran', 'Kalika Paran', 'Uma-Parvati Paran', 'Shiv Paran', 'Radha Krishna Paran', 'Ritu Paran' (which is based on six seasons) and best of all 'Bharatmata Paran and Ganga Paran (an exclusive composition on the holy river Ganga). World famous 'Shabad Dhrupad' singer and 'Jori Vadak' (Guru of Punjab Gharana) Sardar Baljeet Singh has been greatly impressed by Lalit Mahant's art. So he made a 40 minutes documentary on his composition on Gods and Godessess. This doumentary film is to be kept in Foreign archives. Lalit Mahant displays remarkable energy and ability in creating the awareness of people about traditional Indian Music. He is the pattern of Ujjain Chapter of Indian National Sangeet Sankalp. He is invited as performer and judge by various states. This mean of music has wonderful & deep knowledge astrology and palmestry and his predictions are always precisely correct. He is a dedicated man who is known not only for his personnel achievements but also for having taught a number of students who are learning Tabla, Violin, Sitar, Santoor, Vocal and Dance. Some of his students have received scholarships from president fund.